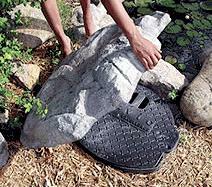 Artificial stone cover designed for use with the Savio Compact SkimmerFilter. 24 inch x 24 inch x 5 inch Lightweight. Long lasting acrylic and fiberglass construction. Since each item is individually cast, the coloration may vary from the image shown.